Neither of these are accurate. 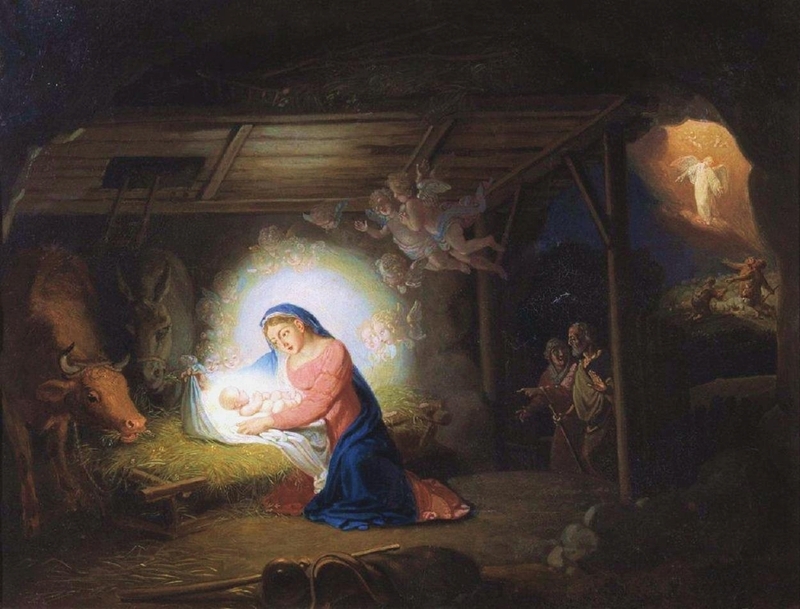 The baby Jesus did not look like that and the scene of his birth did not look like that. We know this, but we don’t complain a whole lot. We are used to sentimentality at Christmas, and anyway we don’t have any photographs of the actual scene to compare. 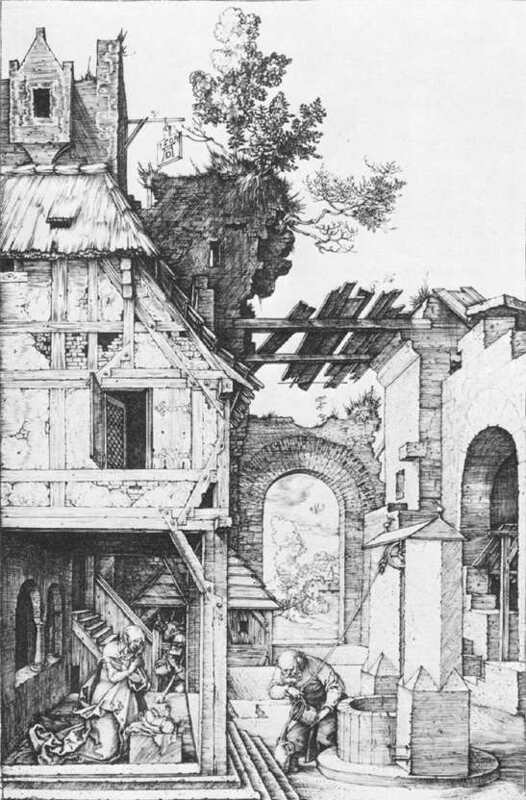 Consider the first of the the two engravings above by Dürer. It is the one with the earlier provenance and is somewhat more rich in detail. We see a medieval house and courtyard with a well. There is no attempt to replicate a Mideast Jewish home of centuries past. The house is dilapidated with portions of the structure falling apart. One might even sense a falling from wealth into poverty. Visually one’s eye is drawn first toward a crouching man pouring water next to the well. He is at the lower edge of the frame, but he is placed horizontally at the center. The building structures, from the sloping roof line, to the archway, to the diagonal rope of the well, all point towards the man. He is the central figure of the picture. Secondly one sees the woman and baby to the left, within the house’s frame. She is also placed near the lower edge of the picture. We can safely assume that the man is Joseph, the woman is Mary, and the baby is Jesus. 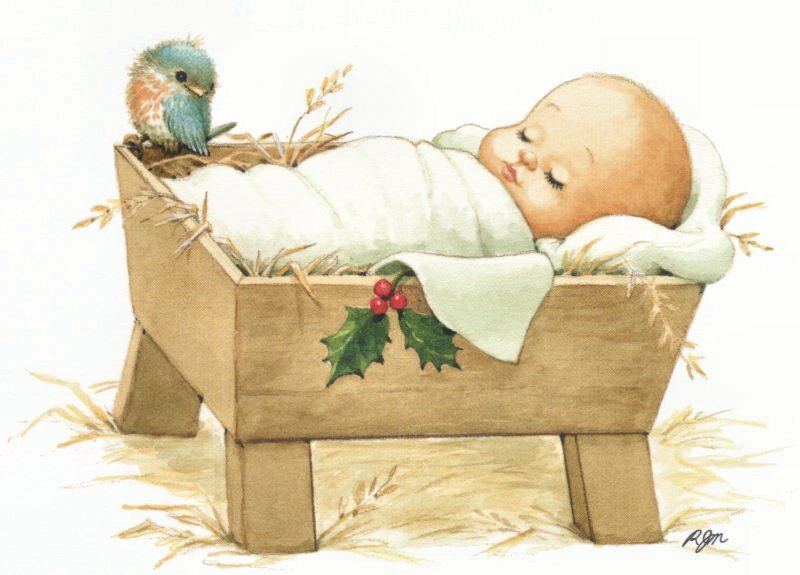 There are several key elements that make this image a “nativity.” Even without the engraving’s title we could assume (with our knowledge of western art) that an image where a baby lies as this one does, with a woman in a posture of veneration towards the baby as is this woman, would be a nativity. On the other hand, there are many elements that undercut the expectations of the genre. Where is Mary and Jesus? They are placed lower left, small compared to the overall composition, and somewhat lost in the most detailed section of the image. Joseph is visually the central figure of the composition. And yet it is he rest of the picture, the dilapidated house and structure, the strong vertical elements drawing our eyes upward away from the figures, the arch and tattered roof, the tree growing out of the ruins at the very top, that make the nativity content seem almost secondary. This is a mundane scene. The people are little, the world is running down, the baby is of no real consequence. But, of course, we know otherwise. The history of the world, of all of creation, turns upon this baby. He is the incarnate God humbled. He will grow, mature, become a man who will teach, heal, die and rise to life again. He will return as king, bring into fullness his kingdom. The world, from that point onwards will never be the same; it is not the same even now. Then why not create an image more glorious, more focused on the savior, more rich in “God beams” and adoring onlookers? Where are the shepherds, the wise men, and the star glowing above? They are all absent, and I believe Dürer knew what he was doing. The cute little pictures of baby Jesus and the quaint and sentimental nativities do not highlight the utter absurdity of the gospel. The way God does things is patently crazy. Many notable thinkers have pointed this out, but even the average person like myself can see the strangeness of it all. The wisdom of God is foolishness to humans. When Christ was born it was a huge event cosmically, but it was as insignificant as a birth could be humanly speaking. Mary and Joseph were ordinary people living ordinary lives. They were poor folk living in a backwater. Their daily lives were mundane, filled with common tasks. At least that is how everything they were and everything they did would have looked to you and me if we had been their neighbors. Dürer knew this. In his engraving he captured the remarkable ordinariness of the event. It is a message of the humanity of Christ, the frailty of his life, the absurd contingency placed upon the incarnate God. Jesus was a marginal person. Of course, it is not a factual picture, as though Dürer imagined himself there in time and space, rather it is a truthful message of the Word became flesh and dwelt among us in radical contingency – not only contingent upon God, but contingent on these two young adult humans (Mary may only have been fifteen years old) and their community. And who are we? We are merely actors in a story. We are entirely contingent on our creator. We are glorious creations who are as ordinary as can be. Jesus was one of us. That Joseph should be the focus of this nativity is key. Mary and Jesus are, historically and possibly cosmically, a kind of unit. Mother and son. They get their own portraits as well. There are many a Madonna with baby Jesus on her lap. In this nativity Joseph is serving his wife and son. Joseph doesn’t get a lot of play in Christian history. He is merely a member of the supporting cast, as he is here. And yet, are we not all members of the supporting cast? Is not, then, Dürer saying something about the rest of us in this nativity? Rather than drawing you into a sentimental nativity scene where one’s focus is on baby Jesus, we are given a scene in which the central figure is the one humbly serving the baby Jesus and his mother. It is as though we are told, “If this (God become man in the humble form of a baby) then this (you become someone for whom serving others is your vocation).” Dürer may be asking, in the most subtle way, where do you stand? This might be a stretch, but notice the building has a sign hanging from its upper reaches. On that sign is Dürer’s signature. He may be making a connection, of sorts, between himself and this dilapidated building. Could he be saying symbolically that Christ has come to dwell in him? 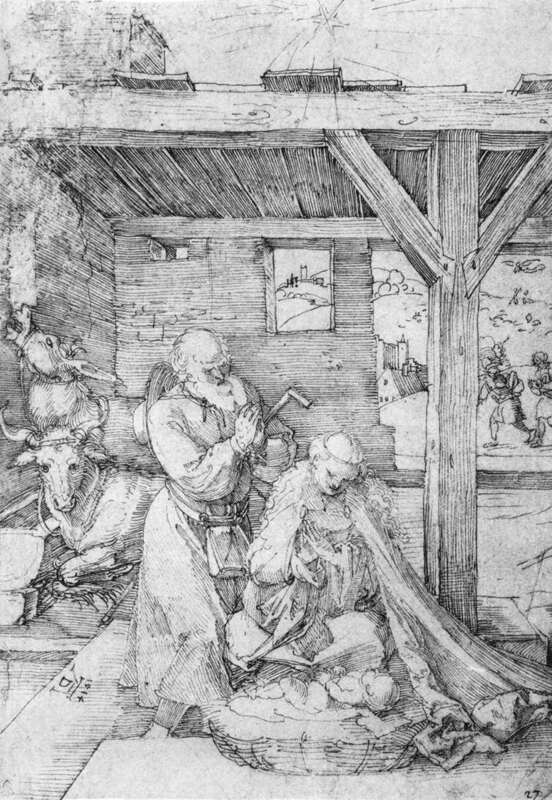 Ten years later Dürer created another nativity scene (the second engraving above) in which he continued the ordinary human quality of the earlier engraving, but this time Mary is central, with all three players grouped together. It is less about the setting and more about these three humans in the midst of something they know is radically important though none else do. I imagine that Dürer had grown closer in spirit to this little family since the time he created the earlier engraving. In a sense one might say he moved from making a theological point of sorts to a position of affection. Can one not say this is also the same movement many of us make as God takes us through the process of sanctification? One thing for certain, Dürer was not making Christmas cards, he was telling us about his faith. Final note: There is much more one could say about these engravings. Albrecht Dürer was part of the Protestant Reformation. He was profoundly affected by the social and theological implications of that historical sea change. He was also a key artist in the Northern European Renaissance. His art reflected changes in art at that time, which included changing perspectives on humanity, nature, and personal freedom. I have not bothered to dive into how these images are part of all that. Nor have I tried to unpack them phenomenologically or psychologically (in terms of the “beholder’s share”). They are far more rich and complex in those terms than this post warrants. If I tried I would be over my head, and this post would become a book. >Might I suggest such a book? I think a book unpacking some deeply significant pieces of "Christian art" would be a fabulous project and homeschooling resource? >You know Axon you are pushing my buttons – in a god way. I would very much like to write a book or two. We'll see. Maybe I should take it on, but I will have to improve my discipline and habits! So far I have been too lazy and too busy for such a project.